The approach must be person-centered, collaborative with other governmental/law enforcement agencies, data-driven and culturally responsive, Macchione added. Conference topics ranged from housing to caring for those with severe mental illness. 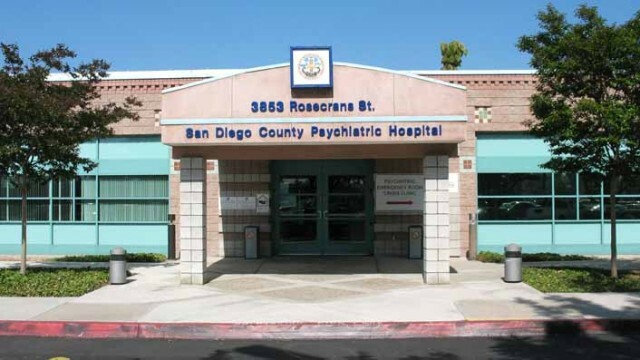 In July, board Chairwoman Kristin Gaspar called for a confab after Tri-City Medical Center in Oceanside closed its behavioral health unit, citing a federal mandate over building requirements. Along with more behavioral health closures and financial challenges, Gaspar said the region continues to deal with mentally ill people in the criminal justice system, some of whom are violent. Because the state of California has shifted costs for mental health treatment, counties are left to balance priorities, Gaspar said. “All eyes are on San Diego,” Gaspar said, adding the county now spends $658 million on behavioral health services, but that investment needs to be part of a collaborative approach with the state and federal government. Nearly 9 percent of adults and 16 percent of teenagers in the county have serious mental health issues, he said. In 2017, 458 people in San Diego County took their own lives, Bergmann said, while 43 percent of homeless people report mental health issues and 24 percent in psychiatric care are homeless. Nearly 70 percent of psychiatric hospital visits also involve substance abuse, Bergmann said. San Diego Mayor Kevin Faulconer urged county to help “lead the change,” as the current approach isn’t working. Last year, the city’s homeless crisis led to an outbreak of Hepatitis A, which killed 20 people and sickened 600. The way San Diego dealt with those on the streets wasn’t sufficient, so the city set up bridge shelters and a storage center, the mayor said. If voters next week approve Proposition 2 — allowing bonds to fund housing for the mentally ill — the county and city must work together on how to properly spend money, Faulconer said. Sheriff Bill Gore said there are plans to allow detention centers to connect the county HHSA’s medical record system, which will lead to better care of inmates. He said his department is adding 15 clinicians to its jail staff and working on an alternative custody program that will offer mentally ill offenders drug counseling. District Attorney Summer Stephan recommended a countywide advisory council featuring mental health specialists, community leaders and law enforcement as a way to further improve treatment options. Along with prevention and intervention there should be special crisis centers for those needing immediate treatment, he said. Board and audience members watched videos featuring people who overcame mental health struggles. Those subjects were at the meeting, and received applause for sharing their stories.